Confidently know what’s going on at home with MyQ® Technology. It lets you monitor and control your Gate Operator and home lighting from anywhere (when paired with the Internet Gateway). Receive email or text alerts so you always know the status of your gate and houselights. 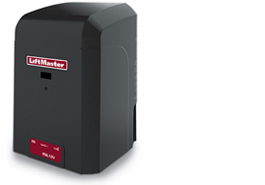 Get on and off your property even when the power’s out with our Battery Backup feature and ultra-efficient Power Management System – up to 114 cycles or up to 63 days. Get durable protection and easy access for service with High Density UV-Resistant 1-Piece Polyethylene Cover. Rated for gates up to 25 feet in length or weighing up to 800 pounds. Never wait for the gate and safely enter your property with Security+2.0® – patented multi-frequency secure radio technology virtually eliminates interference and gives you quick and secure access to your property with enhanced range and performance. The installation of a RSL12VDC Solar Gate System can qualify for a 30% tax credit on the installed system cost.